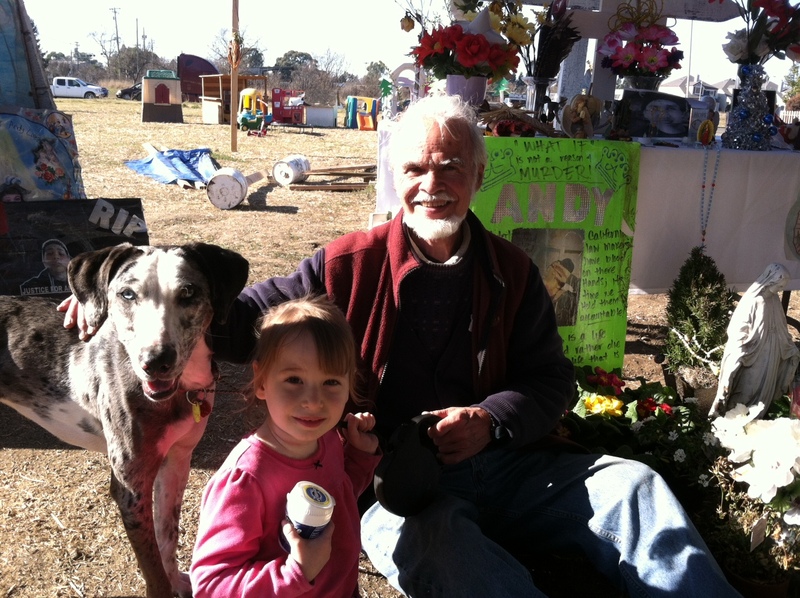 Writer Shepherd Bliss is shown at the memorial site with his dog Winnie and young friend Emily. Photo by John Taylor. The following article by Guy Kovner is related to the essay on moral injury posted a few days ago. In the essay, writer Shepherd Bliss described the shooting of teenager Andy Lopez by Erick Gelhaus, an Iraq War veteran and deputy sheriff. After a memorial to Lopez was erected, it was damaged by fire and then rebuilt. There was never a question about rebuilding the fire-ravaged memorial to Andy Lopez on a southwest Santa Rosa lot where the 13-year-old boy was slain on Oct. 22. “It was a matter of everyone coming together to get it done,” Nicole Guerra said Sunday morning at the site on Moorland Avenue. About 100 people worked on Saturday to reconstruct the makeshift shrine, restoring a tent-covered structure around an altar for Lopez, who was fatally shot by a Sonoma County sheriff’s deputy. “Bigger, better, stronger,” said Jamie Cairo of Santa Rosa, describing the memorial with white, freshly painted shelves holding flowers, mementos and photos of Lopez. Repairs began on Thursday, following an early morning fire attributed to candles burning within the memorial, and Guerra said she put out word for the reconstruction to commence at 11 a.m. Saturday. The new memorial rests on concrete blocks, and fire-proof panels will be added to the structure, said Josha Stark, the impromptu foreman. Lopez’s family asked that the altar remain at the center of the memorial, and neighborhood youths made some suggestions, as well, Stark said. Lopez was walking along on a sidewalk on the east side of the lot when he was shot by Deputy Erick Gelhaus, a 24-year Sheriff’s Office veteran. Gelhaus told police he thought the boy’s airsoft gun — which looked like an AK-47 assault rifle — was a deadly weapon. A wooden cross that was singed by the fire is now mounted above the altar, and potted flowers form a cross on the ground in front of a small statue of the Virgin Mary. Vince Campos of Cloverdale, who was helping erect an ancillary canopy on Sunday, said he also has participated in protest marches. “We just pray and hope for justice,” said Campos, who has two teenaged sons. County officials are working to establish a park at the site, where neighborhood kids played before Lopez was shot. Guerra said her son Tony, 13, had been a close friend of Lopez since the two were in kindergarten. Tony “has a lot of sleepless nights,” she said.